Many people think there is only one resurrection, but scripture tells us distinctly of two for the first is called the thousand year millenium and the second is known as the Great White Throne Judgement of the living and the dead. The seventh and final trump has sounded at this time and so brings in the return of Christ. The Lord wants us to know that a day in his time is not twenty-four hours, but a thousand years and the millenium begins the day that he returns! “But, beloved, be not ignorant of this one thing, that one day is with the Lord as a thousand years, and a thousand years as one day”. (2 Peter 3:8). Scripture has foretold us of this blessed event for it is a time the people of God have long waited for. When Christ returns we shall all be changed in the twinkling of an eye, and every eye will see the Saviour of the world! “Behold, I shew you a mystery; We shall not all sleep, but we shall all be changed, In a moment, in the twinkling of an eye, at the last trump: for the trumpet shall sound, and the dead shall be raised incorruptible, and we shall be changed. For this corruptible must put on incorruption, and this mortal must put on immortality”. 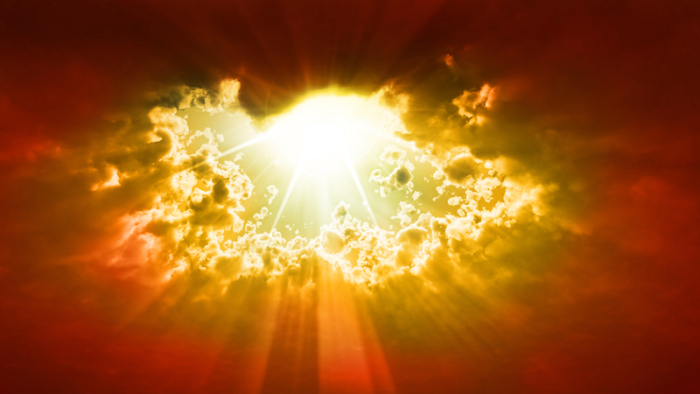 (1 Corinthians 15:51-53) “Behold, he cometh with clouds; and every eye shall see him, and they also which pierced him: and all kindreds of the earth shall wail because of him, Even so, Amen. I am Alpha and O-meg’-a, the beginning and the ending, saith the Lord, which is, and which was, and which is to come, the Almighty”. (Revelation 1:7-8). Let’s see what happens at the first resurrection and who are the one’s that will be able to take part in this wonderful time when the saints of God will be called priest’s of God and Christ! During the thousand year span we see satan who has deceived the nations is bound and cast into the bottomless pit where he will be for the entire thousand years til he is then released again for a season. “And I saw an angel come down from heaven, having the key of the bottomless pit and a great chain in his hand. And he laid hold on the dragon, that old serpent, which is the Devil, and satan, and bound him a thousand years, And cast him into the bottomless pit, and shut him up, and set a seal upon him, that he should deceive the nations no more, till the thousand years should be fulfilled: and after that he must be loosed a little season”. (Revelation 20:1-3). After satan is bound the judgement of the saints begins and blessed are all who are able to take part in this for it is the FIRST RESURRECTION in which the second death will have no power over them as they are the saints of God who refused the mark of the beast and were persecuted for the witnessing of Jesus. It is these people who will reign with Christ and are priests of God and of Christ! Only those who served Christ and God will be in the millenium as the dead will later be at the Great White Throne Judgement as we will later read about. “And I saw thrones, and they sat upon them, and judgement was given unto them: and I saw the souls of them that were beheaded for the witness of Jesus, and for the word of God, and which had not worshipped the beast, neither his image, neither had received his mark upon their foreheads, or in their hands; and they lived and reigned with Christ a thousand years. But the rest of the dead lived not again until the thousand years were finished. This is the first resurrection. Blessed and holy is he that hath part in the first resurrection: on such the second death hath no power, but they shall be priests of God and of Christ, and shall reign with him a thousand years”. (Revelation 20:4-6).